All the chocolate essentials from James Beard award-winning pastry chef, Jacques Torres! 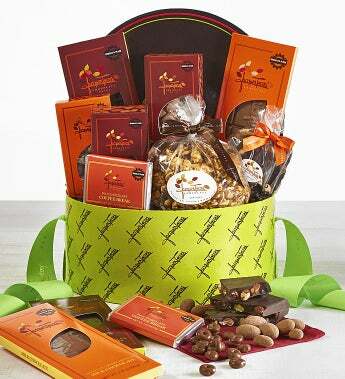 This Simply Chocolate Exclusive Jacques Torres Gift Box is the perfect gift and party companion. Gift Set Includes: House Blend Bar 60%, Milk Chocolate Bar, Mini Coffee Bar, Milk Chocolate Cheerios (CHEERIOS is a registered Trademark of General Mills), Dark Chocolate Corn Flakes, dark chocolate almonds, caramel popcorn, dark bark. All the chocolate essentials from James Beard award-winning pastry chef, Jacques Torres! This Simply Chocolate Exclusive Jacques Torres Gift Box is the perfect gift and party companion. Gift Set Includes: House Blend Bar 60%, Milk Chocolate Bar, Mini Coffee Bar, Milk Chocolate Cheerios (CHEERIOS is a registered Trademark of General Mills), Dark Chocolate Corn Flakes, dark chocolate almonds, caramel popcorn, dark bark. All presented in a beautiful signature hat box.